In the previous walkthrough for the SubmitToSharePointList changes, we submitted data to three lists, all with a single mapping, a single submit connection, and the new, much simplified command syntax. 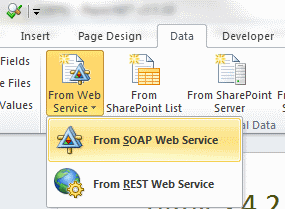 If you didn't hang onto your form template from last time - here's one that you can start with - mind you, the form is pointed to my development SharePoint sites, so just about everything will need to be repointed to your environment, but at least you won't have to start all over. Also, this form is injected with a qRules trial - so if you download it after 9/15/2012, you'll want to re-inject it to enable qRules again. I've set the field to be repeating, since I want the user to be able to add multiple files. Now, I have a decision to make. 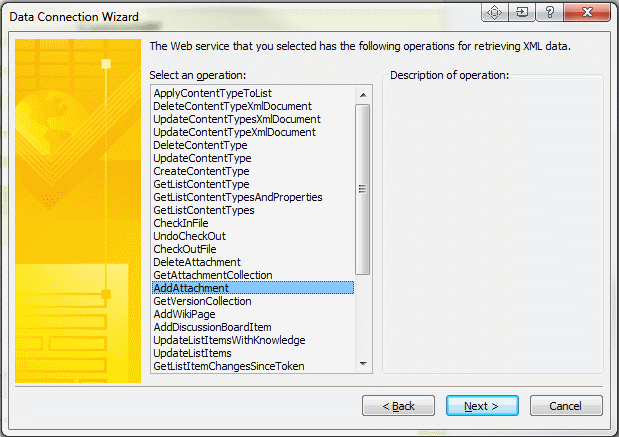 There are two options when adding attachments to my list item - I can keep the file in my form XML and add it to the list item in SharePoint or I can simply upload the file to my list item and remove it from the XML. Since I don't want to keep the file in two places, I'm going to take the second option - I want qRules to remove the file from my form after saving it to my list item. 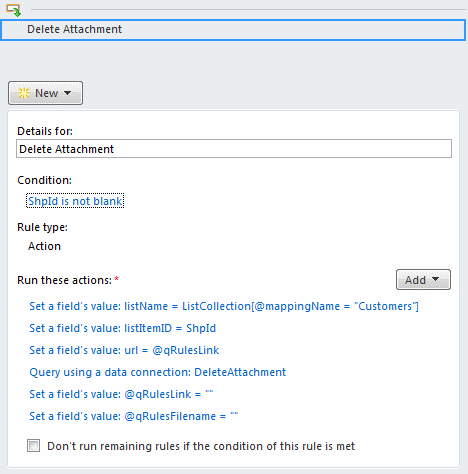 The presence of these attributes on the attachment node indicates to qRules that you want to have the file removed after it has been uploaded (like the functionality of the SaveToSharePoint command, only for a list instead of a library). 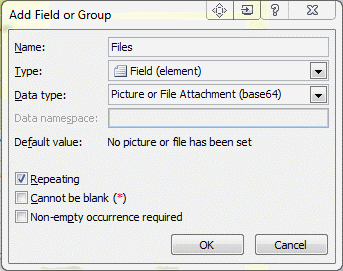 Next, we need to modify our list mapping file to indicate that we have an attachment field. Now, if you have worked with the SubmitToSharePointList command before, you may have had to re-do your mapping each time you wanted to make a change. 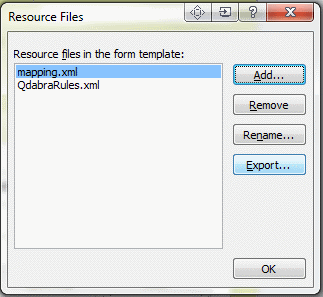 We've improved that experience in qRules 4.2 - we can now import our mapping into the mapping form. And click the Export button to save the file. 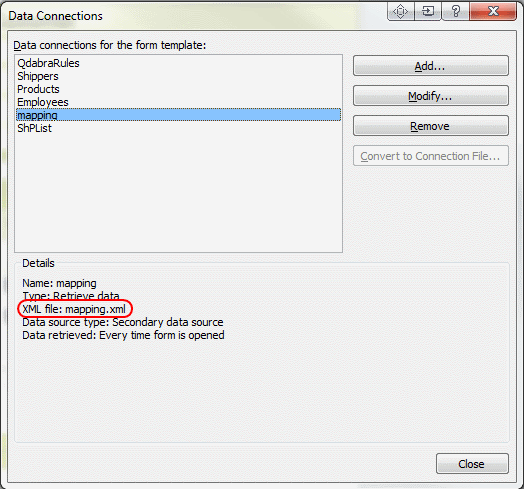 You'll get a warning about the form deleting existing mappings, which you can click OK on, and then select the mapping file you just exported from your form. Your existing mapping will be imported - all that remains is to attach your template to the Source XSN field - much better than remapping every time, don't you think? 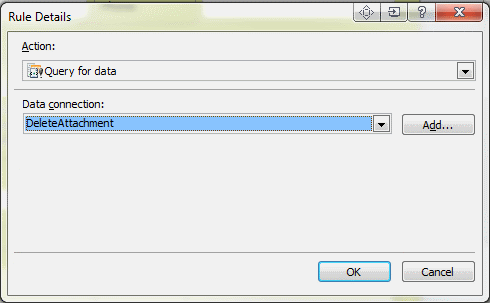 Click Next - no need to set any of the query parameters, so click Next again, then one more time - in the final screen of the dialog, deselect the "Automatically retrieve data when form is opened" checkbox and leave the default name for the data connection - you can name it something else if you like, but keep track of the name, because we will need it when we modify our command. Remember, case cOunTs - you need to use the exact same spelling and casing. 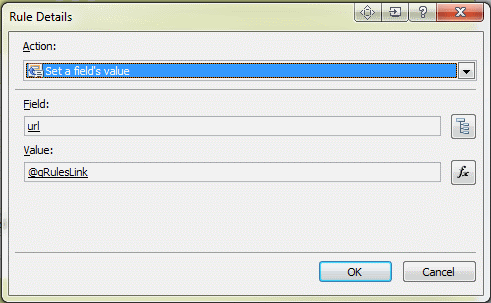 Extra - Add Delete Logic! So - this is all well and good. Provided your users never ever make mistakes. But every now and again, someone may attach and save the wrong file. It would certainly be nice to allow the user to delete the file from the form, wouldn't it? 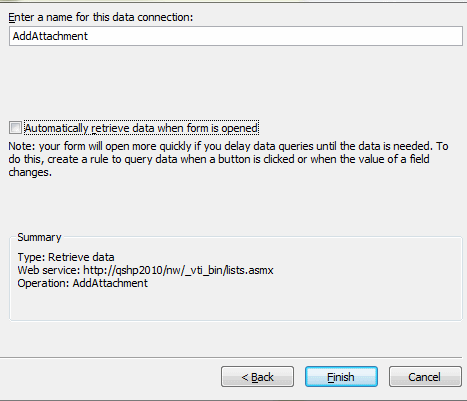 Don't bother filling out any of the query parameters, and deselect the option to automatically execute the data connection on load (just like we did for the AddAttachment data connection). 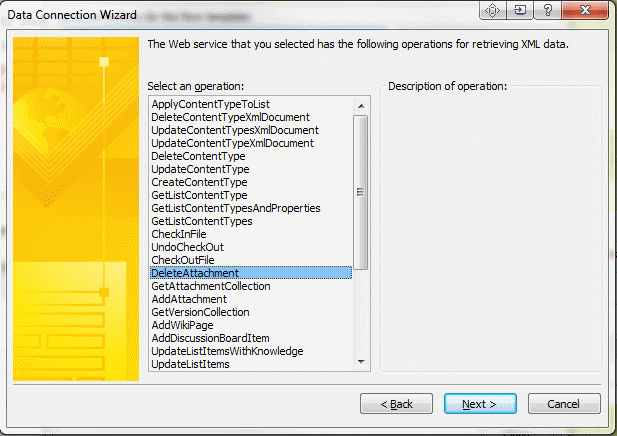 In a perfect world, our web service method would return some useful information to us - sadly, it doesn't (or at least not anything that InfoPath is going to tell us about). 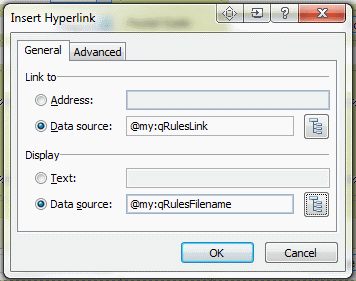 If the query fails, any rule actions after it won't run, so I generally work on the assumption that if my query succeeds, my attachment will have been deleted, and add two more rule actions to clear out the qRulesLink and qRulesFilename attributes. 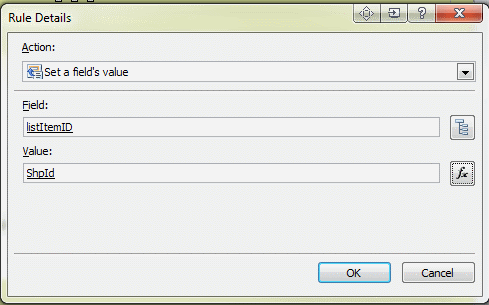 However, you do have some options for error handling. 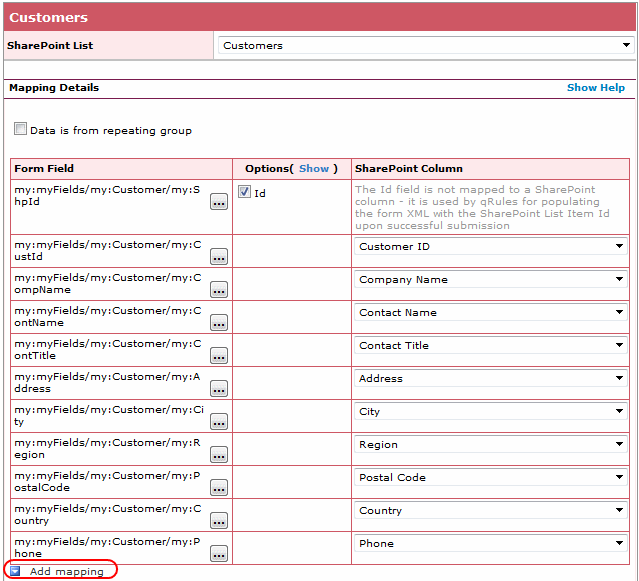 I've simply chosen to let InfoPath return a query error in this case - and I added a condition to only run if the SharePoint ID field is populated. 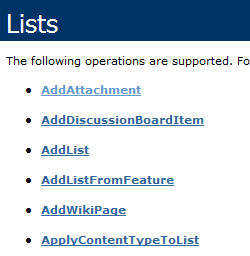 So, now our form submits to three related SharePoint lists. It can include attachments. 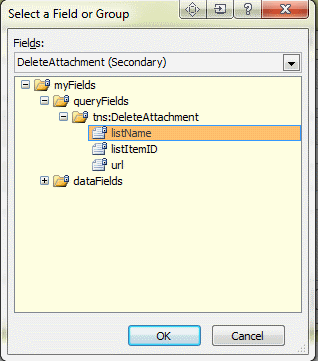 The user can delete attachments. Here's the final form, in case you want to take a look at any of the logic. 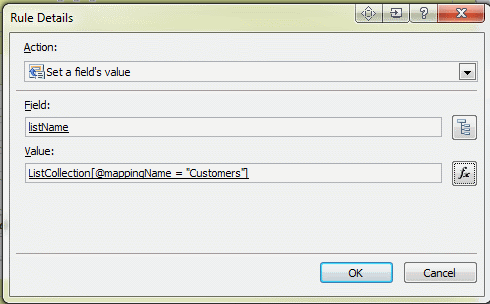 Next up - submitting just specific mappings. Hang onto your form and your test site!